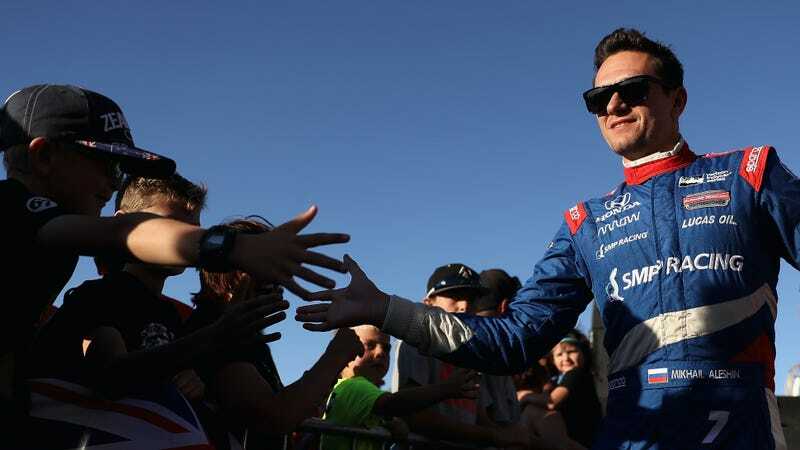 Russian IndyCar driver Mikhail Aleshin is stuck in France after competing in the 24 Hours of Le Mans due to unspecified issues with his visa to enter the United States, his team announced this week. Canadian driver Robert Wickens, who has a full-time ride in the touring car series DTM, will fill in for Aleshin during Friday’s IndyCar practice sessions at Road America. Since competing in the 24 Hours of Le Mans with SMP Racing last weekend, Mikhail Aleshin, driver of the No. 7 Lucas Oil Schmidt Peterson Motorsports Honda in the Verizon IndyCar Series, has been unable to leave France due to immigration issues preventing him from returning to the United States. The executive team at Schmidt Peterson Motorsports has been working diligently on Aleshin’s return to America to compete in this weekend’s KOHLER Grand Prix. However, at this time, the Russian driver will not arrive to Road America in time for any on-track sessions scheduled for Friday, June 23. The team have elected for Canadian Robert Wickens to pilot the No. 7 car until the immigration issue is resolved. Aleshin became the first Russian driver to race in IndyCar when he joined the series in 2014. A Schmidt Peterson Motorsports representative stressed to Jalopnik that Wickens is only filling in for Friday’s practice sessions at the moment, and declined to comment further on Aleshin’s visa issues. Curiously, this isn’t the first time an IndyCar racer has been kept from entering the United States by immigration officials. Visa issues prevented Swiss driver Simona de Silvestro from entering the United States in 2011, which forced her to miss an IndyCar race at Sonoma Raceway. So, while there’s more than plenty of political drama surrounding Russia, border controls and the United States at the moment, it’s too soon to jump to any conclusions as to why Aleshin may be having issues with his visa. All we know is that it can’t be fun to be stuck in France while someone else is turning laps in your car.